Elegantly curving from slender points to a substantial ergonomic middle, the Didier Metal Ballpoint Pen brings class and crisp modern shine to your promotion. 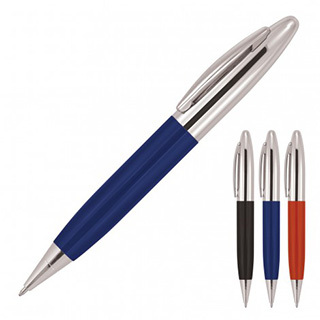 Gifting this metal barrelled twist action, retractable ballpoint can be made into a professional act by printing or laser engraving your promotional logo or personalization to one of three possible positions (upper barrel, lower barrel and cap), giving you ample options. Black ink flows smoothly from the 1.0mm nib of the plastic Parker type refill.